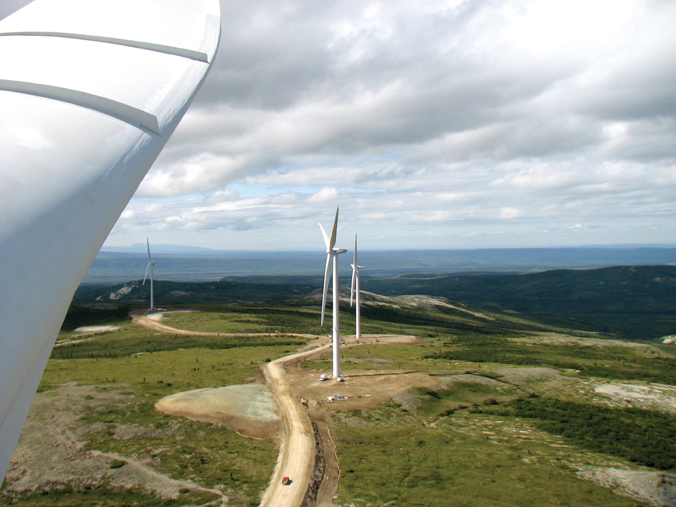 Golden Valley Electric Association—and contractor Michels Corporation—took on one heck of a demanding project with the 25 MW Eva Creek Wind farm in the Interior of Alaska, one of the most northern utility scale wind power projects on the planet. The basic details of building the Eva Creek Wind project don't sound too daunting, at least on the surface. It involved building a 12-turbine, 25 MW project. The kicker was that it had to be built at 64 degrees latitude, in Alaska, and the only access in was via a single rail line that led, in turn, to a road leading to the site—with grades up to 10 percent. Suffice it to say, Golden Valley Electric Association's (GVEA) Eva Creek project is unlike any wind project built in the Lower 48 states. In fact, in the planning stages, the utility was uncertain how many construction companies would even be interested in building such a project in Interior Alaska. Wisconsin-based contractor Michels Corporation answered the call. It took a few years to get to that point notes GVEA's project manager, Greg Wyman. In the late 1990s, the state of Alaska was building a new 50 MW experimental coal power plant in Healy, Alaska, adjacent to GVEA's existing coal plant. The intention was that GVEA would operate the plant once it was completed. "As part of the permitting for the new power plant, the board of directors of GVEA worked with the National Park Service, the Sierra Club, and some other environmental groups, and made a commitment to look into and study wind power," says Wyman. Ultimately, the GVEA board made a resolution to have 20 percent of the utility's nameplate capacity coming from renewable energy by 2014. Their peak capacity is about 200 MWs, so that meant achieving 40 MWs of renewable power. GVEA already has a 17 percent share in a hydro power plant—the Bradley Lake Hydroelectric project, about 500 kilometers away, which amounts to about 20 MW. "With that in mind, we started looking at a 20 to 50 MW wind farm and what would be possible with our system," says Wyman. Studies done in 2001 and 2002 focused on the areas that would be within reach of GVEA's service territory, and Eva Creek was one of two prime sites selected for further study. "We put up some met towers, looked at things further, and ended up focusing in on Eva Creek because the site was right underneath a transmission line that we already had in place." Further studies were done, and additional met towers were put in place over the next six years to study the wind resource. "We really could not push the button on building the project, though, because the financing was not there at the time." In the fall of 2009, the Internal Revenue Service gave GVEA the go-ahead to issue clean renewable energy bonds, which provide nonprofit utilities with low cost capital. "This was a big step in moving the Eva Creek project forward," says Wyman. "We were able to look at financing that made sense." He noted that GVEA, a ratepayer-owned utility, was building the wind farm, would be the owner/operator, and was not following an Independent Power Producer or developer model. "Then the Obama administration came out with the stimulus program funding, and one of the benefits is that we were able to get a buy back on the interest rate on the renewable energy bonds. So we were able to sell them with a 1.2% interest rate. "That put us over the top—with all the economics panning out, the project was a go. That's when we started looking at the details and who would be interested in putting what is really a small wind farm at 64 degrees latitude in Alaska." What they've been able to build is one of the most northern utility scale wind power projects on the planet. 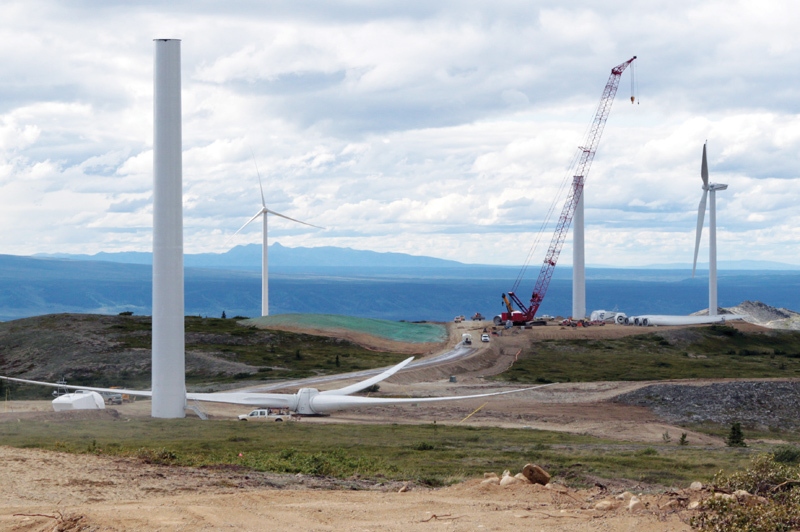 Wyman noted that there are smaller wind power projects in Alaska and some northern wind farms in Scandinavia, so Eva Creek is certainly in a class of its own in North America. 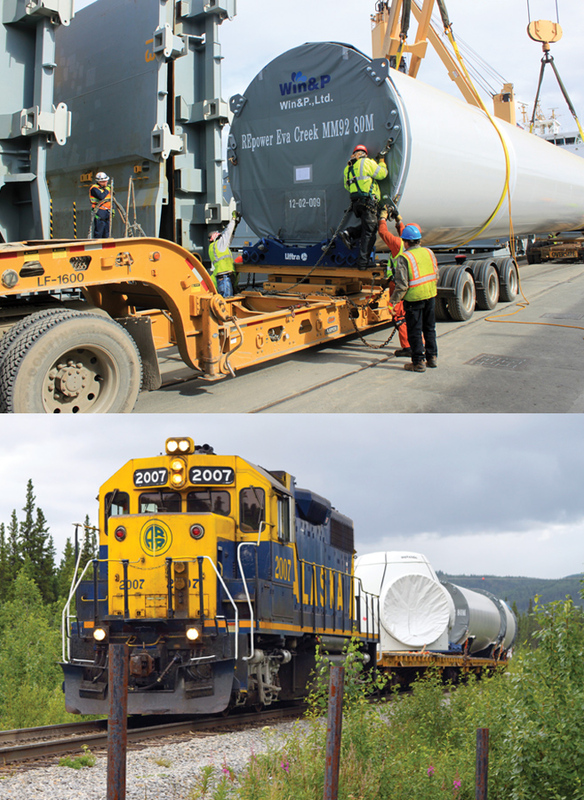 Getting the wind turbines to Alaska involved cargo ships, trains, and trucks. The area leading to the Eva Creek wind power site is separated from the highway system by a major river with only a single transportation link—an Alaska Railroad rail bridge. Everything had to be brought in by rail then trucked to the project site. In a state that is so dominated by oil production—Alaska produces about 570,000 barrels of oil daily—the move by the utility to an alternative energy source was relatively easy and supported by ratepayers, as long as there would be no adverse effects to their rates. "Virtually everyone was behind it," says Wyman. "They really liked the idea. We have such high electric rates here that anything that could have a positive effect is attractive. A lot of our power generation is based on oil, so we have high priced power." Power costs are in the area of 22 to 23 cents a kW hour. About 37 percent of the utility's power comes from oil-fired power plants, with the balance being coal plants, hydro, and now wind power. They can occasionally purchase power from another utility in Anchorage—power generated by natural gas, which is less expensive than the oil-generated power. "Our power mix is heavy on oil," says Wyman. "Our mantra at GVEA the last few years is to do what we can to get away from oil, whether it is towards renewables or natural gas." There are, however, no natural gas resources in the area. There is plenty of wind, though. The wind project had the backing of the state government, which was essential since the project is located entirely on state land. "The only private interests are some sub-surface rights that are privately owned. It took a bit of education with some of those folks." With all this support, the project moved ahead. But there were still hurdles. "Everyone thought the wind power project was a good idea, but they did not believe we could get it done in a timely manner." That's where Balance of Plant contractor Michels Corporation came into the picture. Wyman noted that part of the reason Michels was chosen for the job was it has a track record of delivering on demanding construction projects. The company has 4,000 MW of wind experience, but it also has decades of general construction experience. "What they showed us was their logistical capabilities, and we saw early on that what would make or break this project was the logistics." First was the logistics of getting 12 REpower wind turbines to Interior Alaska, which involved cargo ships, trains, and trucks. "In terms of transportation, it was a little bit of everything," says Wyman. Next there was getting the components and construction materials on site. The area leading to the Eva Creek wind power site is separated from the highway system by a major river with only a single transportation link—an Alaska Railroad rail bridge. "Alaska Railroad has a line from the Anchorage area up to Fairbanks, and the bridge happens to cross the river right at the base of the hill leading up to the site," says Wyman. Through the latter part of 2011, and a good part of 2012, that one rail bridge with an adjacent 45-inch walkway, would be the one and only link bringing in thousands of tons of materials and equipment—and people. "Everything—every crane, every truck, every blade, every gallon of oil, every worker—had to come across that rail bridge." the site. The loaded rail cars from Arkansas were put on a rail barge in Seattle, which took them to the town of Whittier, Alaska, where they were put on the Alaska Railroad line. The towers came from Korea and were shipped to the Port of Anchorage. "Though it was not planned this way, the towers and the nacelles showed up in Anchorage within a day or so of each other," explained Wyman. "They were off-loaded at the port and stored for three weeks, until we were ready to accept them at the site. Because of the rail and access issue, we only had so much space to store material and components." The nacelles and the towers were trucked into the town nearest the site, Healy, about 250 miles from Anchorage, and transferred to rail cars there. Eva Creek wind project contractor Michels Corporation had a rough mining trail to start with for the access road. It had to be widened and re-aligned to handle the large—and heavy—loads. There were also about 4.5 miles of road required between the 12 turbines. "There were a lot of steps," says Wyman. "They went from ocean vessels to the ports to the trucks to the rail, and when they got over the railway bridge, we had to get them off the railcars and put them back on a truck and truck them up about 10 miles and 2,000 vertical feet to the ridges in the foothills of the Alaska Range." Wyman notes there could have been component damage with this amount of handling. "But they really came through in excellent shape. There were two little nicks on one of the blades, and the towers and the nacelles were perfect." On the last leg of the journey, the truckers proved their stuff. "One of the surprises on the project is that the trucks were able to pull all the components to the site without push/pull assistance—a semi pulling a trailer was able to make that entire climb. There were several stretches of 10 percent or 10 percent-plus grades, and they didn't need any special equipment to haul equipment up there." They had a rough mining trail to start with for the access road. It had to be widened and re-aligned to handle the large—and heavy—loads. "We had to put several million dollars into the road to bring it up to standard." There were also about 4.5 miles of road required between the 12 turbines. "All in all, we had about 15 miles that we had to upgrade or build." As with the turbine components, every single piece of road building equipment—dozers, scrapers, dump trucks, you name it—had to come in over that single rail bridge and line. There was a staging area where the rail line intersected with the road, but the town of Healy, about 10 miles away, served as a secondary staging area. "There is a good rail yard there," says Wyman. "They had some sidings where they could stockpile railcars, and all of the trucks would unload there." All of the materials for the concrete were also hauled in by rail. A concrete batch plant was built in the middle of the wind project site. The cement was brought in by rail and hauled up to the site by truck. The on-site aggregate was judged not durable enough, so the gravel for the aggregate was hauled up from the start of the 10-mile road. The water for the concrete was accessed via wells. Although it sounds complicated, this process went off with hardly a hitch. "It went unbelievably well," says Wyman. "There was not a single breakdown of the batch plant or a concrete truck." On site, Michels used one large crane (a Manitowoc 16000) for erection and a number of smaller cranes for miscellaneous work, including the huge task of handling all this material. Once the turbines and associated equipment made it to the site, the work there was fairly uneventful. "We have two ridges for the wind farm," explained Wyman. "They are very rounded, and we are above the tree line, so there is no forest interrupting the wind flow. Once you get up there, it's very straightforward construction." The site is at an elevation of 3,000 feet. The project workforce peaked at 180, and a work camp was set up on the highway-accessible side of the rail bridge. The workers were bused to the rail bridge, walked across on the adjacent walkway, and boarded another bus to get up to the work site. Working closely with the Alaska Railroad was key to the success of the project, says Wyman, as this rail line is an essential transportation link in the state. Trains travelled twice a day from a coal mine in Healy to Fairbanks, and oil was hauled in from refineries in the Fairbanks area to Anchorage. Passenger trains also ran twice a day between the two cities. "In the middle of summer, there were probably 12 trains a day, though a lot of them ran at night, and when it was slower, there were six to eight trains a day." He noted that Michels had a shuttle train with a dedicated engine in Healy, to take rail cars and materials to the offloading site at the bridge. "There was a fair amount of time to unload things; we might have a train at 10:00 in the morning and the next one might be 5:00 at night. But it had to be orchestrated perfectly. The siding at the project site could only hold nine rail cars. So they had to shuttle things back and forth so they could get the nine empty cars out, pull the full cars in, and get back to Healy and get off the main line." Wyman gives high marks to Michels and Alaska Railroad personnel for making this system work so well. The REpower MM92, 2.05 MW turbines selected for the project are expected to work well in what is quite a cold climate. "One of the main reasons we went with REpower is their willingness to adapt to our climate. Some of the features they have for a cold climate we liked better than the other turbine suppliers." An attractive feature of the turbines is that service personnel can climb straight from the nacelle into the hub. "It's a simple thing, but in our climate, we see that as a big plus," says Wyman. With the completion of this project, GVEA has now met its commitment of achieving 20 percent power from renewable energy. And the project has left pretty much anyone who worked on it with lasting memories of working on northern wind—quite literally.